Thank You Martin Luther King Jr.
On this day, we can take a moment of silence or a moment to speak up for what we believe in and both would be acceptable. 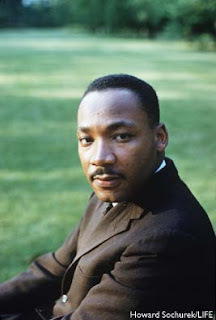 This one man decided that he would take step after step in the direction of freedom for every human being, no matter what race, even though he could not see the top of the staircase that he had set out to concur. I have often thought of what it would be like to not be able to walk into a movie theater with other races or to be segregated to a particular part of the bus or anything of that stripe. I was always taught to love everyone and to show love to others even if they do you wrong. It just seems like an obvious behavior to me, not to mention that the returns are endless in every way. When I think of the friends that are in my life at this very moment, I can honestly say that I would have to think twice as hard to judge them by their race or creed or individual experiences that have brought them to where they are. 1. In 1934, five years after his birth, his family discovered Martin's name had been recorded wrong on his birth certificate. The certificate said Michael King, so his name had to be legally changed to Martin Luther King Jr.
2. In 1939, Martin sang with his church choir in Atlanta at the gala premiere of the movie Gone With The Wind. 3. He skipped the 9th and 12th grades in school and entered Moorehouse College at age 15. 4. He had Bachelor degrees in sociology and theology. In 1955 he received his PH. D. from Boston University. 5. From 1957 until his death in 1968, he traveled more than 6 million miles. He gave over 2500 speeches during his travels. He also wrote 5 books and had published countless numbers of articles in newspapers and magazines. 6. In 1964, at age 35, he was the youngest person to receive the Nobel Peace Prize. 7. According to a Gallup poll, King is the second most admired person in the 20th century. 8. In a contest sponsored by the Discovery Channel, he was voted the 3rd Greatest American of all time. 9. Presently there are 730+ U.S. cities that have streets named after King. 10. King is 1 of 10 20th century world martyrs who has a statue at Westminster Abbey.